They are the champions . . . ! THE chattier, more personal, note of this page indicates that it started life as a Letter from Nantwich. It is now an "official" Nantwich Town F.C. page. The picture of the Vase and the logo below, left are taken - with permission - from the Football Association's website: www.thefa.com. THE Dabbers - or Nantwich Town F.C., if you prefer - brought home the F.A. 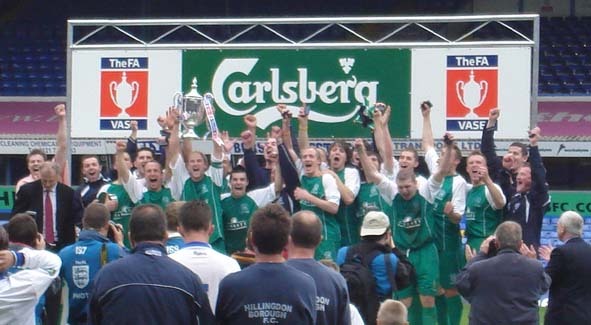 Vase to Nantwich in 2006. They made history on May 6 when they beat Hillingdon Borough 3-1 in the 32nd F.A. Vase final at Birmingham F.C. 's ground, St Andrew's. A total of 3,286 saw the game which was described as "the biggest game in the club's 122-year history by the Nantwich Chronicle. The success meant the Dabbers were the first Cheshire side to bring the trophy to the county. Despite its name, the Vase is a cup of reasonable size. Not quite as big as the F.A. Cup, maybe, but something well worth having in the Dabbers' trophy cabinet. To say they reached the final was to understate their achievement - the competition began with 493 teams in contention for the title, and finally it was down to just two. Fortunately there was no need for a penalty shoot-out - which I always think is an unsatisfactory way of deciding a match (but what else can you do?). Goals came from Andy Kinsey (in the 14th and 68th minutes) and Stuart Scheuber (in the 30th). Unfortunately, Kinsey (captain for the day) dislocated his shoulder as he threw his shirt to the crowd to celebrate his goals. Quoted in the national paper, the Mail on Sunday, Player-Manager Steve Davis said: "I've never seen anything like that before. He could get a club fine." I doubt if that is going to knock the shine off Andy's day too much. Well done to club manager Steve Davis and his men for bringing glory to the town. The whole town was surely behind the Dabbers whether they are club supporters, sports fans in general - or not. I must admit that I put myself in the last category - although I always like to know how local teams are doing. All sports. ON a personaI note, I was rubbish in the compulsory football and cricket at school, and my lack of enthusiasm and skill showed in my junior reporter days on the Nantwich Guardian when I had to cover Dabbers' games. What a nightmare that was - fine if there were goals to record, but I really struggled if it was 0-0 at the end of the game. The subtleties of the players' skills went over my head. And standing on a open pitch on a freezing winter's afternoon was not my idea of fun. Luckily for me, when I moved to The Chronicle, the sport was ably covered by Alan Jervis. lThe pictures of the three young Nantwich fans - Matt Simpson, Matt Roberts and Matt Clarke - (above) and fans, Ian and Maureen Parker (right) were taken by Gareth Roberts. My thanks to him for letting me use them. NANTWICH Town officials would have been glad of some different news to make the headlines. Their new £2million ground on Kingsley Fields (replacing the Jackson Avenue site) had come under fire in previous months as the club asked for more funds - over and above the initial grant - from the local authorities to meet rising costs. river bridge. But it has been used on many occasions so motorists canniot mind too much. So the club was awaiting planning permision from the former Crewe and Nantwich Borough Council and then it would be a case of "all systems go" a month afterwards. lCongratulations to player-manager Steve Davis on being named manager of the month for April 2006 in Division One of the North West Counties Football League. 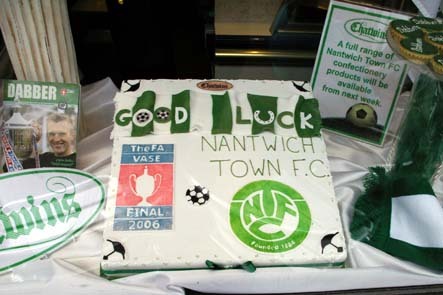 TOP confectioners, Chatwins of Nantwich, ("family bakers since 1913") were behind the Dabbers to the extent that they introduced a range of cakes to mark the occasion. This included the large cake front centre of this window display in their Pepper Street shop - and gingerbread men wearing the Dabbers' green strip. It was a great gesture for the fans to get their teeth into. John Chatwin (a director of the company) was a fervent Dabbers fan - as were many of the staff.